I have had a breakthrough, sure it's not something major to most people but, I have found a simple recipe that makes me a little more comfortable in the kitchen. Up to this point I've been fine with making pancakes, eggs, bacon, and other 1-2 ingredient meals. I've always wanted to be more comfortable in the kitchen and put together something bigger and better but I've been too scared to try it or burn something. A three course meal sounded overwhelming; actually a main dish with more than 3 ingredients sounded frightening. 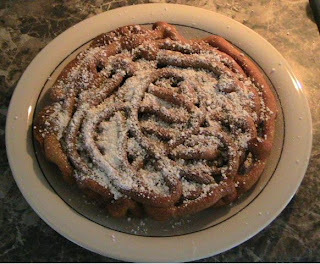 So, last year I found a recipe to a food item that I can't stand to pass up at a state fair - a funnel cake. It is a small step I can make that will help me become more comfortable in the kitchen and it is for a food that I enjoy and that desire for the end result inspired me to make the step. It allowed me to break out of my comfort zone yet still feel comfortable doing it. I have found the same thing to be true about taking steps to be more frugal or living more eco-friendly. It is about taking small steps that inspire us and put us just on the edge of comfortable. 1. In a deep skillet, heat about two cups of oil over medium-high heat until hot. Test the temperature by dropping a pinch of flour into the hot oil. If it sizzles right away without smoking, it's perfect. 5. Sprinkle with powdered sugar and serve. It was a lot of batter for two people so next time I will cut the recipe in half. It did come out just a tad crispy around the edges. I was so happy to have accomplished something in the kitchen and I'm ready to try it again and do better. I have a hard time in the kitchen too. 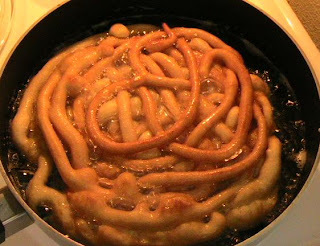 Thanks for the recipe, I think I will try it tomorrow as a treat for my husband while he watches the basketball game. It took me 5 minutes for the mixing and about 15 minutes from beginning to ending. And not a lot of mess either - I go crazy about messes. While it's pretty easy to follow well-written recipes (just buy a Betty Crocker cookbook at your next garage sale), I think the key to cooking food yourself without a recipe is to learn to build up from components. Meat is a component. Learn how to season and cook it consistently in a skillet, and you've got a building block. Pasta and grains are components. Learn how much salt it needs and what consistency you like, you've got another building block. Learn how to cook individual vegetables of your choice with the right salt and other seasonings. Learn how to cook them boiled and stir-fried. Now building a great meal is like putting Legos together. Meat, cooked and seasoned, grains cooked and mixed with cooked vegetables, etc. Learn to make a basic tomato sauce, you've got another block. White sauce, another block. Learn the correct use of cheeses, another block. Learn how to cook eggs to different consistencies, another building block. In other words, don't go into the kitchen and think that you have to go from a bag of ingredients to souffle or multi-layer casserole in one step. Learn how to cook 4 or 5 basic foods well, and they can be combined into many meals. Cook 10 or 12 basic foods well, and you've got *lots* of meals. Add fruit and other ready-to-eat foods and you'll hardly every touch packaged food again. And don't agonize about baking. Many cooks, even professional chefs, won't bake exactly because it demands relatively high precision in ingredients and timing. They buy baked goods from bakeries because bakeries can specialize in that sort of thing. I was looking over my starred items on my Google Reader, noticed I still had this recipe saved. Just wanted to let you know it's become a favorite "treat" in our house and I make when when we've got kids over as well. I always end up making another batch, cuz it goes so quickly.